I pulled away, but he held my wrist tightly. The burn mark was about the size of a large wooden match head. I looked at Moises and asked what was happening. “Una nueva medicina, nunca he visto”he said, shaking his head. Remembering the extraordinary experience I’d had with nü-nü, I let Pablo burn my arm a second time. 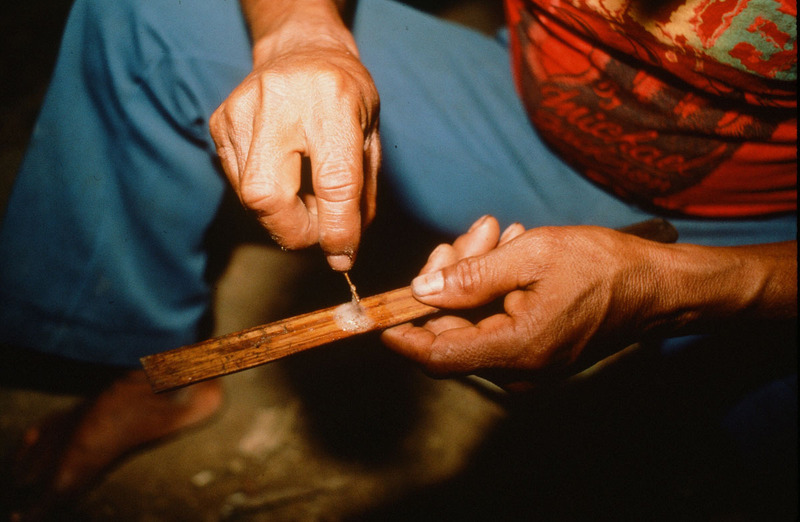 He scraped away the burned skin, then dabbed a little of the sapo onto the exposed areas. Instantly my body began to heat up. In seconds I was burning from the inside and regretted allowing him to give me a medicine I knew nothing about. I began to sweat. My blood began to race. My heart pounded. I became acutely aware of every vein and artery in my body and could feel them opening to allow for the fantastic pulse of my blood. My stomach cramped, and I vomited violently. I lost control of my bodily functions and began to urinate and defecate. I fell to the ground. Then, unexpectedly, I found myself growling and moving about on all fours. I felt as though animals were passing through me, trying to express themselves through my body. It was a fantastic feeling, but it passed quickly, and I could think of nothing but the rushing of my blood, a sensation so intense that I thought my heart would burst. For perhaps 15 minutes the rushing got faster and faster. I was in agony. The pain became so great that I wished I would die just to get it over with. But I didn’t die, and the pounding slowly became steady and rhythmic. I gasped for breath. And when it finally subsided altogether, I was overcome with exhaustion. I slept where I was. When I awoke a few hours later, I heard voices. But as I came to my senses, I realized I was alone. I looked around and saw I had been washed off, carried to the un-walled hut Steve and I were using, and put into my hammock. I stood and walked to the edge of the hut’s platform floor and realized that the conversation I was overhearing was between two of Pablo’s wives, who were standing nearly 20 yards away. I didn’t understand their dialect, of course, but I was surprised even to hear them from that distance. I walked to the other side of the platform and looked out into the jungle: its noises too were clearer than usual. And it wasn’t just my hearing that had been improved. My vision, my sense of smell, everything about me felt larger than life, and my body felt immensely strong. When I saw Pablo later that evening, I explained what I was feeling, with hand gestures as much as language. He smiled. It was good sapo. Strong. 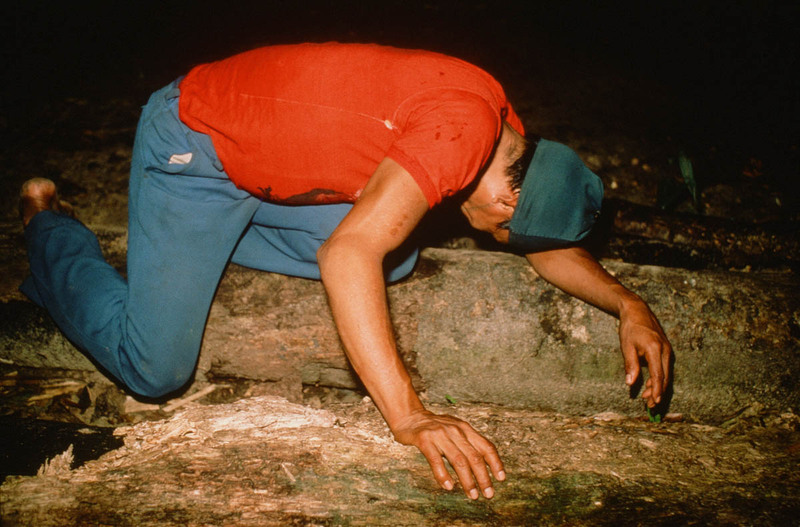 Because of the bioactive nature of so many of the peptides found in sapo, it is difficult to imagine anyone dying from its use. But there will always be an exception, so the basic approach has to be one of caution. The worst of my bacterial infections in my right calf in 2013—the one that needed two operations and subsequent skin grafting—developed while I was out in the jungle. It was already pretty awful. I thought sapo might help clear it up, but Pepe refused to give sapo to me. He thought the poison in my leg, rather than being eliminated, might spread throughout my body. I was upset with him at the time, but he made the right call. Why take the chance? I could always do sapo another day. And I have. In my mind, the same refusal to give sapo would apply to someone who was asking for it and was drunk or high. You would just be asking for a possible bad interaction, and for what? I am similarly cautious with anyone on heart medicine or other heavy pharmaceuticals. This is not the sort of medicine that you give to strangers on a street corner. Additionally, regardless of the experience someone claims to have, I always give a low dosage—two burns at most—the first time, unless he or she is out in the jungle with me. In that circumstance, I’ve already seen the person’s behavior for several days, had them on the diet my staff and I prepare, and have seen how they handle jungle hikes and taking ayahuasca. Those people generally get as many as three burns of sapo if they want—though most opt for two the first time and then, a couple of days later, ask for three or four. Four is the maximum anyone can have unless they have extensive history of using it in my presence. In my experience, the effects of sapo escalate exponentially. Two burns are much more than twice the strength of one; three is considerably stronger than half-again two; four is simply tough to take. Depending on the day, the way a person is feeling, the strength of the sapo on a given stick, and the size of the tamishi used for burning, even people with a lot of sapo experience can become overwhelmed and terrified. My team in the jungle keeps a sharp eye on the people doing sapo. At the most basic level, that means making sure that when people decide to lie down on the ground they don’t lie near stinging ants. But we also keep an eye out for excessive sweating. Most people will sweat some with sapo, but when you notice that it looks excessive, there are a couple of things to do to keep the situation from getting out of hand. First is to gently check the person’s forehead to gauge their temperature. Before touching someone in that state, always announce what you intend to do. “Bobby, you look like you’re really hot. I’m just going to check your temperature, all right?” And then do it as unobtrusively as possible. If the temperature seems normal, leave the person alone. If it’s high, have the person lean forward and gently pour a little water on the crown of their head, letting it run off their forehead. Repeat a few times until the person waves you off. Also, always have plenty of toilet tissue or paper towels available, along with drinking water, so that if someone vomits they can clean their mouth and wipe their lips. Be sure to wipe the sapo from the recipient’s arm after about 15 minutes to prevent them from accidently getting a bit on their finger and subsequently into their eye. It’s very, very painful. 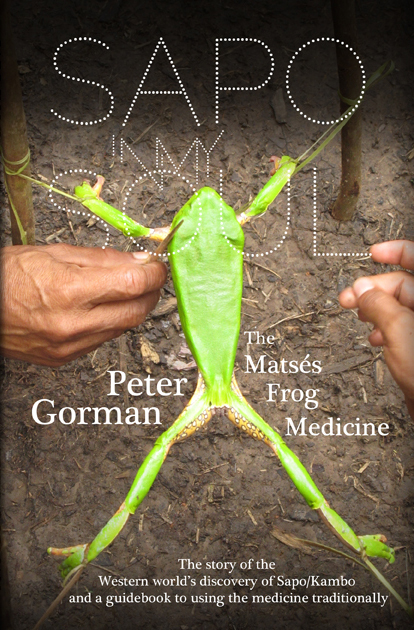 The same applies to anyone handling either the frog itself or a stick of sapo: Wash hands immediately, preferably with soap and water, to prevent accidental eye contact. Do not, under any circumstances, let someone lie on their back in the early stages of sapo intoxication. It can be difficult to turn them over if they suddenly begin to vomit and then choke. All of these precautions mean that there always has to be a person or two not under the influence of sapo during a sapo session. If everyone is under the influence, the chances of something going wrong increase exponentially—as in the person on their back vomiting and being unable to turn over. Remember that the acute cleansing intoxication phase will last only about 15 minutes. So pay very close attention during that time. Sapo, like any strong medicine, needs to be treated with full respect to minimize potential problems. Some people will take a couple of hours to recover from sapo. Never do it unless you’ve got the time and place/space to allow for that. Even people who normally are up and about and feeling great after sapo can sometimes subsequently get walloped and need to rest. Another precautionary note: If a group of five people do sapo, one of them is going to wind up looking like a frog. Their lips will swell, as will their eyelids and the soft tissue under their eyes. They’ll have frog face. It’s a disconcerting but very temporary condition. The only reason I can think of for this reaction is that with the enormous flush of toxins from your body during sapo intoxication, your liver and kidneys might be overwhelmed, and some of those toxins accumulate in soft tissue until it’s their turn to be eliminated. It will rarely last more than an hour. And the very last note: Because your body is flushing out toxins that have been hiding for a long time, don’t be surprised if your first several urinations following sapo use are dark yellow or greenish. Similarly, you may wonder what the heck you ate for lunch when you defecate. Your stool can be considerably darker and have a different odor than normal. Don’t let it worry you: It’s just a load of toxins that you didn’t need finally being flushed from your system.